Until incredibly recently there was a beautiful part of Italy that was lesser explored and undiscovered by the wider world - hidden Italy was to be found in the stunning region of Abruzzo. Don't get me wrong, Abruzzo was a region well known by Italians who secretly enjoyed the delights of this mountainous part of Italy and kept the secret of Abruzzo to themselves...but as more cheap flight operators open up our horizons, so Abruzzo has become infiltrated by the rest of us with regular international flights now arriving in Aeroporto di Pescara which is the gateway to the entire region. 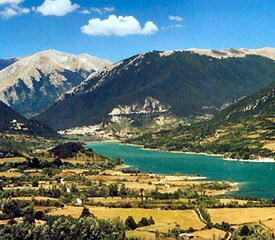 Located in central eastern Italy and bordered to the east by the beautiful Adriatic Sea, Abruzzo is two thirds dramatic mountains and one third national park - it is a region blessed with stunning sandy beaches, dramatic cliffs, snow capped mountains, medieval towns and villages, broad plains, amazing castles and an abundance of rare flora and fauna - and on top of all of these fantastic delights is the news that property for sale in this part of Italy starts from as little as USD 40,000 (GBP 20,000). It's true - the fact that Abruzzo has been hidden away from the mass glare of overseas property hunters and speculators, international retirees and those looking for an Italian holiday home means that you can buy a beach front villa for peanuts, a rural farmhouse needing renovation for next to nothing and a rare and beautiful medieval town house that would sell for hundreds of thousands of dollars elsewhere in Europe for the same price as a one bedroom apartment elsewhere in Italy! The demand for property for sale in Abruzzo in Italy especially among British and German buyers has surged and the demand from tourists to rent winter ski properties and summertime sunshine homes has also surged and all of a sudden the Abruzzo region of Italy has awoken from its reverie and realised that it is in demand and has much to offer. Of course the intensification of tourism and buyer interest will have an overall positive effect on property prices over the medium term - but in the meantime anyone who has ever dreamed of a Tuscan farmhouse or a villa on the coast of Italy should check out Abruzzo as an alternative destination which offers a whole host of delights whilst remaining an affordable option with an abundance of beautiful property stock.